Zen Blades knife sharpening at Kaboodle..
Woody Bailey and his Zen Blades truck visits our warehouse most every week, to sharpen knives you bring to our stores. Woody, who teaches at the Western Culinary Institute and sharpens for lots of chefs around town, doesn’t just pull a knife through a sharpener. 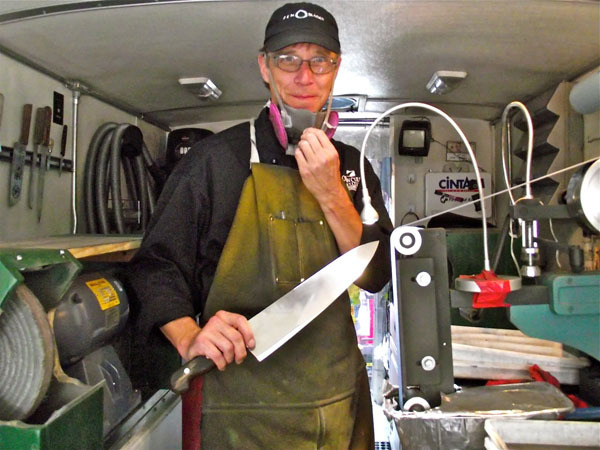 Using his own specialty equipment, Woody rebuilds the edge on each knife , restoring the blade’s original geometry and making it, in his words, wicked sharp. Once Woody is done with them, your knives will be like new. Woody sharpens for us all year ’round, but over the next few weeks, he’s taking a little vacation and he’ll be sharpening for the last time before Christmas on December 19th. Get your dull knives to any Kaboodle store by Tuesday, the 18th, and you’ll have them back, wicked sharp, by Saturday the 21st. Next Post The Happy Winner!